Diagnosing disease often requires analysing and detecting single cells with lab tests that cost hundreds of pounds each. Hospitals in a poor country stricken with a disease epidemic like HIV or malaria simply might not have the funds to run all of those tests. Scientists are looking for a cheaper option. A team of Stanford researchers created what might be the cheapest, simplest solution yet: An inject-printed microchip that can perform multiple tests and costs only twenty minutes and less than a penny to make. In case it’s not obvious, this is very cheap. Diagnostic tests generally require sorting cell types to find the diseased culprit cells, with lab equipment like bulky, spinning centrifuges, membranes or magnets. 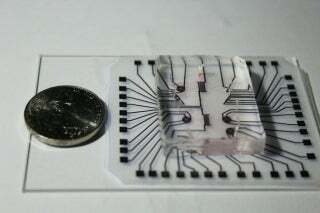 Labs-on-a-chip are an attempt to simplify the process, using droplets of liquid a millionth the volume of a litre of a soft drink passed through a sensor capable of isolating and manipulating single rare cells, screening for drugs, or detecting individual proteins. This latest chip is really a multilayer stack: a layer of conductive particles printed onto a flexible plastic surface using an inkjet printer and a silicone (not silicon) section for holding the sample. Changing the electric current places a force on the particles and moves them around, allowing for sorting and manipulating for any slew of tests. The team ran a lot of tests on their chip, and was able to capture and isolate yeast and breast cancer cells without killing them, in addition to isolating tiny plastic particles. The researchers published their paper today in the Proceedings of the National Academy of Sciences. “Notably, it is straightforward to adapt our platform for a variety of bioparticles and cells with differing sizes and properties, simply by varying the configuration of the electronic apertures and re-optimise it for the cells of interest,” the researchers write. Just hearing about simple lab tests can cause healthcare professionals to panic—you may remember last year’s Theranos controversy. In that case, the should-be disruptor offered a finger prick lab test, though it turned out the company did all its own testing without peer review, according to a New York Times report. That’s completely unlike the lab-on-a-chip here, which isn’t a proprietary product. Instead, the Stanford team has produced the technology and performed a slew of tests with it which have been reviewed by other scientists and published for anyone else to see. In other words, this is probably the real deal, though it’s not clear when the technology will be available for widespread use.